It is going to get cold tonight and start feeling like December. Time to get the fireplace going. There is nothing more festive than a roaring fire burning in the fireplace. WPIX has been broadcasting their Yule Log since 1966 on Christmas Day. Fortunately on Long Island many of us have our own beautiful fireplaces. The mantles are festively decorated and the stockings are hung with care. With all of the trees down from Superstorm Sandy, firewood seems to be everywhere. There is a lot more to wood. 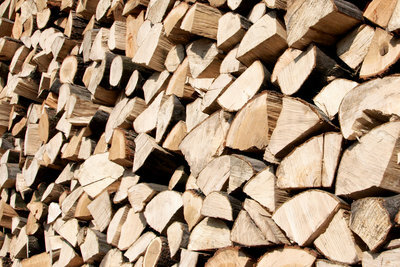 Here are some things to keep in mind before buying this season's firewood. Kiln dried wood is wood that is dried in an industrial kiln. The process dries the wood completely, kills any insects that may have been living in the wood, and produces clean and great looking firewood that is extremely easy to light and keep burning. The other method of drying wood is to naturally season the wood over the course of twelve to eighteen months or more months (depending on the wood's moisture levels), then splitting the wood and allowing it to gradually dry outdoors in the sun, wind, and heat - exposed to the elements. A moisture meter will accurately measure the moisture content of your wood. You can roughly check the dryness of your wood without a moisture meter by knocking two sticks together. If you hear a sharp sound, the wood is probably dry. If you hear a dull thud, the wood is not fully seasoned. Cracking and checking on the edges of a stick of firewood also indicates that the wood is seasoned and dry. On Long Island, we mostly burn Oak and Maple. on the Long Island.com Forum! Subject: LongIsland.com - Your Name sent you Article details of "Tuesday's Top 10: Where to Get Firewood for a Warm Winter"